In all the events that E Squadron excelled in, Cadet Hari was the champion. His agility and skill was proven beyond doubt and we ended winning the Commandant’s Banner as Champion Squadron in 1979. Hari always sported his bright smile – characterised by a broken incisor – a loss he suffered during a boxing bout. We used to undertake cycling tours around Khadakwasla (obviously the unofficial ones) to Sinhagarh Fort, Munshi Dam and Panshet Dam. Nothing could deter Hari during our NDA days, whatever difficulty he faced, he always took it with a smile. It appeared that neither success nor failure had any impact on him – he kept going ahead, without ever looking behind. The very same quality he carried with him during his service as an officer. Hari was commissioned in to Bihar Regiment – Infantry – and I to the Regiment of Artillery. We never served together during our Army days, but did meet many times, especially while travelling to our hometowns in Kerala from Delhi. While I was posted at the Military Intelligence Directorate during the Kargil war of 1999, situation (sitrep) of 06 July caught my eye. It described action of Major KPR Hari and 1 Bihar in capturing Jubar Top. I was not surprised – Hari had it in him and he would have done it that way only. The sitrep said that Hari, disregarding his own personal safety crawled through the boulders over a stiff cliff and destroyed the enemy Heavy Machine Gun bunker and killed two enemy personnel. I knew his gallant act would be recognised and glorified. “On 06 July 1999, Major KPR Hari attacked Jubar Top, an enemy stronghold at a height of 16,800 feet Batalik Sector of Jammu and Kashmir. Major KPR Hari launched a two pronged attack under heavy enemy artillery and small arm fire. He crawled through the boulders over a teep cliff leading towards Jubar Top avoiding enemy fire. He reached 50 meters short of the enemy bunker and in a swift and bold manoeuvre closed in with the enemy bunker along with six soldiers continously firing and lobbing grenades. Major KPR Hari with utter disregard for personal safety destroyed the enemy Heavy Machine Gun bunker and killed two enemy personnel who were engaging the advancing troops. The enemy sensing immediate capture withdrew leaving huge quantity of arms, ammunition and equipment. The post was captured at 0500 hours without any casualty. 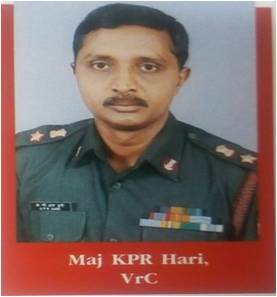 Major KPR Hari then along with another officer kept the momentum of attack and captured Jubar Top by 1800 hours. After I bid goodbye to Indian Army and moved to Canada, I met Hari only once. That was during our course-mate Commander Vinod Kumar’s (Indian Navy) daughter’s wedding in December 2015. He was as cheerful and smiling as he always was. Last year I heard the sad news that Hari was battling pancreatic cancer. I thought that he will beat this ordeal too. He fought like a good boxer of E Squadron, but breathed his last on 17 August 2018. I am sure he will now be smiling and thanking his Creator for a great meaningful life that the God had bestowed on him. Befitting and moving eulogy to a dear friend. Hari was my SSB batchmate, later my squadron type. He has sport in his heart. He introduced me to Squash! Hari, you lived a great life and left lasting memories. Thank you Reji for the blog. You almost brought Hari back to life. Hari was a very dear friend. Always smiling and cheerful. We did our YOs together. Met him at Tvm in 97-98 while I was posted in the brigade there and he was on leave, he heard about me being there and came over as cheerful as ever. Never met him after that but followed his bravado at Kargil. A happy go lucky Mallu Babua from Bihar Regt, that’s what makes IA unique. Babua, it was wonderful knowing you and being associated with you. God bless your soul buddy. Wonderful obituary to our squadron-type, Reji. What about his family? Where are they? I am sure he must have been a great son, husband and father and they must miss him terribly. Hari’s characteristic smile camouflaged the fire in the belly he displayed from boxing ring to Kargil heights. Great soul to find his place in heaven, rather early though. May his family have the strength to bear this loss. Thanks for the excellent write up, Reji. A moving ode. A heart wrenching obituary for a dear friend, classmate, coursemate, and comrade in arms. Thanks Reji. May KPR rest now… Cheers Buddy. My brother served with him in the same unit. Hari is remembered very fondly by the entire unit. We lost a soldier yesterday. Thanks Reji for the write up on Hari!! Oh My God! I was unaware of the loss till I read the last line and am shocked. He was my friend, guide and a great shield in Echo Sqn and I regret not being in touch with him thereafter. Was thrilled to hear about his heroics during Kargil Ops and I never knew that he was battling on another front in recent times. May God bless his soul and my sincere condolences and prayers to his bereaved family. A touching eulogy Reji. Like someone earlier posted, you almost actually brought him back to life. A very sad loss. Such a beautiful article sir. A fitting tribute. Thank you Reji for these sweet words in memory of our dear beloved comrade. KPR we will miss you always. RIP brother. It was a very shocking news about demise of our NDA course mate Col KPR Hari.I remember him a very sporting and warm hearted person.Reji,you have beautifully described some of his attributes in this article bringing nostalgic memories and respect for the wonderful soul. A perfect eulogy to a dear coursemate and a wonderful human being. Always seen him with a smile on his face. That’s how I remember him and knowing him that’s the way he would want to be remembered. Rest in peace dear friend. I lost my dear brother…the only one I had.Happy that he is away from the terrible pain he was going through.Here I must mention the names of Col Anil ,Gopi krishna,Rajeev and his wife,Dr Bonnie ; the Sainik School batch mates who had been by his side through this epic journey.Thank you Reji for this lovely tribute.